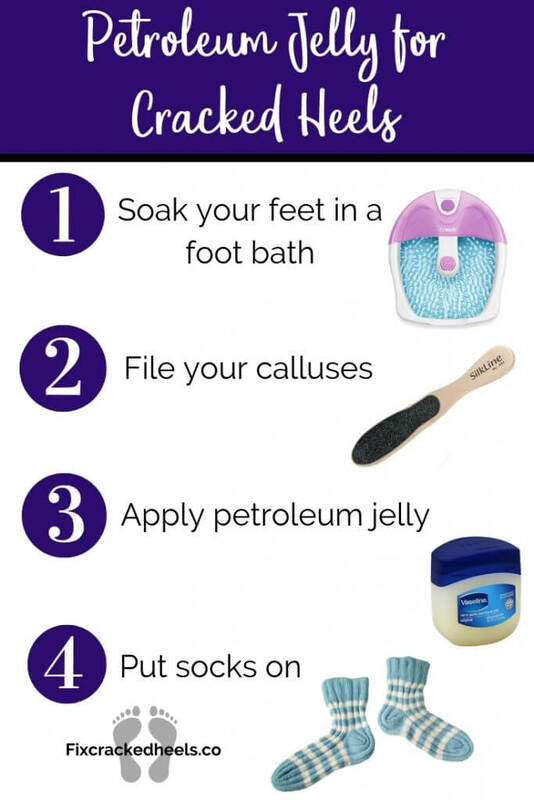 When you have such bad cracked heels you will often try anything to heal them…Even your grandmother’s favourite remedy for everything, Petroleum Jelly. It’s more known by its brand name Vaseline. It is a mixture of mineral oils and waxes, which form a semisolid jelly-like substance. Petroleum jelly is an emollient that helps seal your skin with a water-protective barrier. It works by restricting water loss from the skin, and that makes it perfect for dry skin. Vaseline is inexpensive and has a long shelf life. Petroleum jelly also acts as a barrier to prevent germs or infections in wounds. Above all, it’s used in the manufacture of cosmetics and pharmaceutical ointments. We use petroleum jelly as an additive in foods namely as candies, confectionary products, and baked goods. You can find petroleum jelly in cosmetics and other personal care products. You can also find it in rubber, adhesives and so much more. They make a synthetic version of petrolatum from soybean oil as an alternative to petroleum-based petrolatum. Vaseline intensive care, Nongame Vaseline…..
You could also mix your favourite essential oil or lotion with some petroleum jelly. You could try a DIY pedicure for the best results! Keep in mind most people find that putting it on at night and covering your feet with socks the most effective. Vaseline can stain clothes or bed sheets. Some people may break out when using petroleum jelly because it clogs pores. With this in mind, clean the skin before you apply the jelly to reduce the risk of breakouts. In conclusion, some of grandma’s old-fashioned products are still valuable and still work.